In order to pursue a Bachelor of Science degree program for desktop publishing, a student must have a high school diploma or a GED. In addition, you will need to have satisfactory scores on either the ACT or SAT. If you have previously attended a college or higher learning institution, you will want to submit a transcript from this school to ensure you get the proper hourly credits. No matter where you decide to attend school to work on your bachelor's degree, you will be studying to learn about technical skills and advanced design related to desktop and web publishing. Find the perfect desktop publishing school below. The desktop courses you are required to take will prepare you for the work force by teaching you about graphic design, painting, drawing, and photography. In addition, you may have further coursework that is more specifically related to your major. At the completion of your coursework, you will likely have a portfolio that demonstrates your capabilities related to desktop publishing. As you begin searching for gainful employment, your portfolio will help potential employers get a feel for what you can deliver. Also, many degree programs related to desktop publishing require students to complete an internship. As you begin compiling your portfolio, it may also be helpful as you work to secure an internship position. As you work through yours desktopo publishing degree program, you will need to earn a passing score in classes such as digital publishing, design communication, visual arts fundamentals, typography, graphic design, and computer illustration and page layout. Each of these courses is important to your skills base related to adequate work in the field of desktop publishing. In addition to these focus courses, you will also want to be sure that you take courses in proofreading, keyboarding, and publishing applications. After entering the desktop publishing career field, there are also options for advancing your education. While there are currently not any graduate level programs for desktop publishing, you could decide to further your education in a field such as graphic communication. Your bachelor's degree in desktop publishing will adequately prepare you to perform daily responsibilities such as using computer software and computer programs to create magazines, catalogs, newsletters, or other publications. You may also spend time creating or editing illustrations or charts, developing advertising campaigns, and creating text and associated graphics. Along with using the computer, you will also be expected to utilize digital cameras, scanners, printers, and desktop publishing equipment. While your education will help you learn to use these computer programs, it will still be your artistic abilities that will be displayed. Although you do not have to have a formal degree to obtain a job in this field, having that degree will definitely give you an advantage over fellow job seekers. The skills and knowledge you will possess will enable you to seek jobs as an image designer, a layout artist, a desktop publishing editor, a typographer, or an electronic publishing specialist. Jobs that require similar skills and knowledge are production managers, electronic imagers, art directors, and advertising associates. If you want to be successful in desktop publishing it is recommended that you know the below software programs. Each one is uniquely different than the other in terms of functionality, complexity and price. Graphic Designer – Don’t overlook your ability to apply for graphic design jobs. During your career training you might have be taught software packages that deal in design like Print Shop or even Publisher. These are great tools that you can use as a graphic designer. Also when companies hire graphic designers often they are looking for someone with desktop publishing skills. The term desktop publishing is an older job description title that still used today but often means someone that can assist with word doc creation, spreadsheets, presentations and other front office duties. Website Design – A good web design degree might be what you are looking for. Like with graphic design someone at the company you are working for needs the ability to update or even create websites. The job title website designer can include duties such as marketing and desktop design. Marketing Assistant – As a marketing assisting you’ll work within a marketing department assisting others such as the manager or director with marketing tasks. These tasks can include designing brochures, updating the website, writing for blogs or articles, press releases and more. The great thing about a marketing assistant job is it allows you to use all the things you learned in school as you aren’t focused on just one task. Marketing assisting jobs often turn into others marketing jobs within the company you are working for. Digital Designer – Since so much advertising is digital these days the need for desktop publishers that have digital design ability is growing. Departments need individuals that understand logo design, website creation, banner creation and other digital graphic skills. Smaller companies will higher digital designers or desktop publishers but what they really need is someone that will handle all of their digital needs. Newspaper Layout Designer – They days of newspaper layout and design is now all digital. Even the smaller papers have moved over to a digital design if not 100% online. 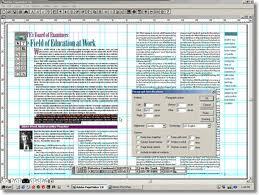 With your desktop publishing and layout skills you can assist newspapers in layout and design.